A photo from The Evening Post, 21 October 1944, of Private Te Runa. What a relief it must have been for whanau to see his smiling face. 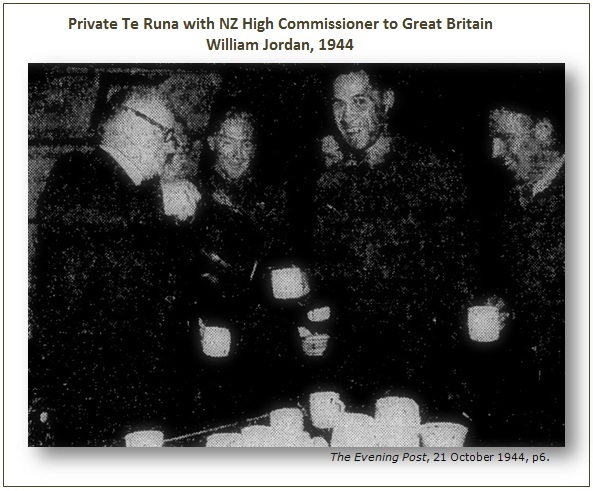 Private Teruna, a Maori soldier who was a prisoner of war in Germany gets a cup of tea from the High Commissioner, Mr Jordan. Private Teruna, who comes from Tokomaru Bay, is one of a party of New Zealand soldiers and airmen recently repatriated from Germany. The Evening Post, 21 October 1944, pg 6 from Papers Past.